WaterAid Ghana's aim for this project is to spread equity and inclusion by addressing the water, sanitation, and hygiene needs of these neglected peoples in the rural and peripheral communities of Akuapem North and South, and Yilo Krobo. WaterAid has worked in Ghana since 1985 and during this time has developed strong links with both policymakers and eight local partner non governmental organizations (NGOs). These partners carry out the day to day management of water, sanitation and hygiene education projects in six out of ten of the countryÃ¢â‚¬â„¢s regions. This work is vital as inadequate water supply and sanitation services contribute to over 70% of disease and death in Ghana, costing the country significantly in terms of healthcare and productivity. 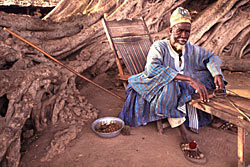 In the eastern region of Ghana, Akuapem North and South and Yilo Krobo, districts are inhabited mostly by immigrant peasant farmers, generally suffering from poor road networks. This transportation problem is particularly acute in the rural and peripheral communities. As a result, development agencies have abandoned work in these three project districts leading to increased rates of poverty as deprived communities are isolated from opportunities to improve their conditions. 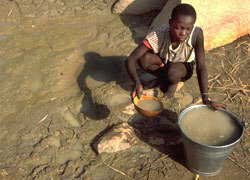 Deplorable water and sanitation conditions exacerbate their poverty. People mainly rely on streams, rivers and other unsafe sources of water. This situation is compounded by open defecation and poor hygiene practices. These conditions are reflected in the growing number of cases of bilharzias, cholera, intestinal infections, and guinea worm. WaterAid Ghana expanded its rural work in 2005/2006 to address these concerns and reduce the vast coverage inequities between the urban and rural populations. Improvements in sanitation facilities are paramount to WaterAidÃ¢â‚¬â„¢s holistic approach of integrating water, sanitation, and hygiene education services. While safe water alone positively impacts the lives of the poor, achieving maximum health benefits requires all three of these crucial interventions. WaterAid Ghana's hygiene promotion approach is based on three key aspects: safety of drinking water (collection, transportation, storage and handling), hand washing (before and after critical periods/events), and safe excreta disposal. Through the use of our hygiene promotion tools, SARAR and PHAST, WaterAid uses community interaction to enhance behavior change regarding the three key areas. The methods used are all based upon the communities' existing knowledge and practices and include practical demonstrations, puppet shows, hygiene promotion tiles, picture books, games, plays, posters and videos. WaterAid GhanaÃ¢â‚¬â„¢s aims to promote proper hygiene practices among 1,500 people in the first year, while aiming for hygiene behavior change of 40% in the target communities by the end of the five-year period. All of our projects in Ghana use technologies that are appropriate to local conditions, affordable for even the poorest in society and easy to maintain. The project focuses on safe, hand-dug wells where water is either lifted using a rope pump or a Nira handpump. The rope pump is a simple technology hand pump that has the potential of reducing the cost of installing hand pumps in Ghana by about 75 to 80 percent. WaterAid Ghana aims to improve sanitation by assisting in the construction of Ventilated Improved Pit (VIP) Latrines and by promoting their use. VIP have a vent pipe included in the design which takes away smells and insects (flies in particular) that come in contact with feces and food. By blocking this transmission route, the likelihood of diarrhea can be greatly reduced, in combination with proper hygiene practices. All of WaterAidÃ¢â‚¬â„¢s programs are designed to work hand-in-hand with our local partners and the community. Across WaterAid West Africa programs, the Local Millennium Development Goals Initiative (LMDGI) is being utilized to address and decentralize the national MDGÃ¢â‚¬â„¢s on a tangible and local level. Encompassing six countries in the West-African sub-region: Burkino Faso, Ghana, Mali, Mauritania, Nigeria and Senegal, the initiative engages local partner NGOs as the operational implementers, in partnership with local government institutions, with the objective of motivating local stakeholders to mobilize and recognize the potential resources in the region. Ã¢â‚¬Â¢ participating in the implementation of the water and sanitation projects. WaterAid GhanaÃ¢â‚¬â„¢s hygiene promotion approach is based on three key aspects: safety of drinking water (collection, transportation, storage and handling), hand washing (before and after critical periods/events), and safe excreta disposal. Through the use of our hygiene promotion tools, SARAR and PHAST, WaterAid uses community interaction to enhance behavior change regarding the three key areas. The methods used are all based upon the communities' existing knowledge and practices and include practical demonstrations, puppet shows, hygiene promotion tiles, picture books, games, plays, posters and videos. WaterAid GhanaÃ¢â‚¬â„¢s aims to promote proper hygiene practices among 1,500 people in the first year, while aiming for hygiene behavior change of 40% in the target communities by the end of the five-year period. Sand, stones, land and labor coordinated through WaterAidÃ¢â‚¬â„¢s local partner ACDEP. WaterAidÃ¢â‚¬â„¢s partner ACDEP (The Akuapem Area Community Development Programme) operates in three districts in the Eastern Region of Ghana. Consistently ACDEP has worked in the most deprived areas in 5 districts over the past 3 years. Blue Planet Run's message for the 2007 run is $25 gives water to one person for life. While we know its not always true, we are trying to target this year's and next year's funding towards that goal. We can revise it in 2009 based on new facts/experiences. This project comes to $74/person. We want to remain flexible and allow for some separation of sanitation costs to see how close we can come to $25 for drinking water. Can you clarify a little more? Can you please expand a bit on the software costs? The Partner staff and other allowances are nearly 40% of the costs. Can you expand on them and the role that WaterAid Ghana will play (10+% of staff expenses) in relation to the partner? please explain why such exorbitant cost to this project. I see there is every reason for it to be funded as the situation seem deplorable but why such a high cost attached ? It's great to see the emphasis on government engagement. Has WaterAid been successful at engaging local and/or other levels of government in Ghana in the past? How do you measure success? The Ghana country program was established in 1985 and has been operating through its 8 local NGO partners since then. Our work with local government has been very successful thus far. The Local Millennium Development Goals Initiative has allowed WaterAid Ghana to partner with four district assemblies who will, for example, undertake mapping exercises that will in turn, inform local development plans. Ã¢â‚¬Â¢	and local government ownership. On the cost issue, I think there needs to be some flexibility in terms of the target of US$25/beneficiary as I think Blue Planet Run understands. There are parts of Africa where costs will be higher or we will simply not be able to help the poorest people. In parts of South and Central America a strict adherence to this policy would mean that scattered, diverse communities with small numbers of inhabitants will be refused service. This is un-justifiable. So, flexibility is needed and I think BPR is addressing this fairly. That said, I do think the costs for this particular project are questionable. I calculate the overheads at well over 50% which is simply unsustainable and I think hard to justify. US$38,000 to a partner for staff and allowance to implement a US$47,000 project is hard to justify. If the vehicle costs are for the partner then that means that partner costs and vehicle costs are more than the materials/hardware, which would be a first for a single project. So, if we are going to have a debate on US$25/person then I think we need to look at the package - is it US$25/person because the overheads are too high or because of field based realities. I would argue that field based realities trumps the US$25 but that case is not helped with overheads at this level. I think the other issue is on partners. While at WaterAid I tried to engage my West African colleagues on this issue with little luck, but the proposal is written as if WaterAid is implementing. The whole document states "WaterAid Ghana's hygiene promotion approach" and "WaterAid uses" and "All of our projects". I think the question really is how does WaterAid support ACDEP, and what is ACDEP's approach, etc. I think there is a problem with partnerships, and is something that PWX should be thinking of as the role of northern NGOs (like Water For People and WaterAid and Care) is to build local capacity to continue without WaterAid, Water For People and Care. We should be working towards ACDEP applying as that is when the partnership starts to blossom - not with organisation like ours acting like middle men. On sanitation - I am not clear how sanitation services will be sustained after the project is completed. It is easy to build lots of toilets but hard to ensure toilets are built when the project is over and new people come into the area. I think this needs further work. Target of 40% behavior change is a good one - how will WaterAid monitor this and what data do they have now from other projects that can show us how the system might work? I would be wary of financing this unless the issue of overheads is addressed and the issue of the role of ACDEP is clarified, with a light on the sustainability of ACDEP. Blue Planet Run is trying to bring in new funding to the water sector. Our target is individuals who we believe will be ready to contribute $25 annually. We are creating an event and a marketing campaign with that message in 2007. While we realize that many projects come in higher, we know that there are enough projects around that amount. We look to institutions/foundations to fund projects that cost higher and/or are focused on other aspects such as sanitation. If they want to use PWX, that is a great option and we will be far more flexible and/or tailor that funding. So, for 2007 i would like to see if we can achieve a target of $25/person. Based on that success and learnings over the next 2 years, we can change our message for the 2009 run. We apologize for the lag in posting, as we had to get in touch with the Ghana Country Program to ensure our responses would best address your queries, as was suggested by PWX. 1. WaterAid West African Country Programs are pursuing an initiative called the Local Millennium Development Goals Initiative (LMDGI) as is mentioned in our application. It aims at building capacities of local government authorities (LGAs) to generate reliable watsan data, plans, and to market the plans and implement them in order to achieve the MDG targets within the local area. The projects emphasize capacity building in addition to direct provision on the part of WaterAid. Emphasis and greater investments are made to build capacities of LGAs and partner NGO staff to scale up watsan services at the district level (district-wide approach) rather than WaterAid and partner NGOs serving individual communities. Therefore as more funds are invested in partner NGO staff, substantial amounts are also invested in LGA staff who in turn work with the NGO partner to develop district-wide plans and several other activities Ã¢â‚¬â€œ sensitization, advocacy, citizenÃ¢â‚¬â„¢s engagement, marketing etc. It is within this framework that we work. Therefore, the high cost on software and staff can be attributed to this emphasis. There are still costs on hardware since the project also includes the actual construction work. 2. On vehicle running cost, that part of the Eastern Region of Ghana is mountainous (The Akwapim Ã¢â‚¬â€œ Togo Ranges) and as stated clearly in the proposal, the target communities are those that most other NGOs are refusing to go to because they are virtually inaccessible. This obviously implies higher vehicle running expenditure. If these costs are to be avoided those communities may continue to live in deprivation. 3. In view of this initiative, WaterAid staff play a more direct role in capacity development of partners (which include the LGAs within this LMDGI framework). Some of these capacity building support activities include sensitization of LGA staff on MDGs, training in data collection and analyses, local development planning, citizenÃ¢â‚¬â„¢s empowerment for accountability, and marketing of local development plans. These activities are reflected in the high WaterAid staff costs as seen in the proposal. Apart from field construction work, WaterAid staff play a more direct role in projects within the LMDGI framework and this may continue for some time as both NGO partners and LGA staff need capacity-building support at the moment. 4. At the WaterAid corporate level Ã¢â‚¬Å“The cost per user is the weighted average across all service delivery projects (ie excluding research, advocacy, etc) completed during the financial year. This implies that it would be wrong (in WaterAid terms) to include advocacy, baseline survey costs, etc in computing the cost per beneficiary. 5. The question regarding the sustainability of sanitation work should be asked for water as well. In Ghana, WaterAid partners put effective management structures in place to ensure sustainability in projects and these structures are not there for water alone. 6. Regarding partnerships, we appreciate that you have drawn attention to the portrayal of WaterAid solely as an implementer. While we do some level of implementation as in LGA capacity building (sensitization, training, etc.) within the LMDGI framework, our partners do the majority of the implementing. I must say I went home that evening thinking about this quite a bit, and I do think the issue of trying to fit a programmatic goal (capacity building and all with some direct implementation by partners who are using implementation to apply their capacity built skills) into a project-specific proposal is part of the problem that WaterAid, Water For People and Care in particular face with BPR as we are all indirect implementers trying to build sector capacity so that we are no longer needed in these countries. This is a particular challenge with BPR as we are all trying to fit BPR's approach - which is interesting and somewhat different - into a broader strategy employed by WaterAid, WFP, and Care that is not focused only on hardware provision and community level training. We too at Water For People are struggling with this, and basically eliminated all capacity building work (except some basic work) from the proposal and are covering it elsewhere, which is not ideal of course but is fair given what BPR is trying to do. The explanation you give above is much clearer than what I read in the original proposal. I still think the issue of partnerships is one that is not resolved - I know how WaterAid tries to work and I know when WaterAid needs to support more directly, but I think there is a language issue in West Africa that has troubled me for some time, and I worry that WaterAid crowds out partner space. This is a seperate issue and I hope we can continue the discussion through another channel. Rajesh will not be surprised to read that I do not agree with his argument above on the marketing approach of BPR and trying to link individuals who contribute US$25 to US$25/beneficiary of new water supply worldwide. I think it is a dangerous message as - if as we all hope, Blue Planet Run is successful - then many organisations around the world (including WFP and WaterAid) will have to swim against a perception that US$25/beneficiary is the target and is based on some sort of programme that has been applied worlwide. It is not - we are confusing a marketing strategy that is interesting with a water problem that is more complex. The target is safe water and sanitation for all. If we focus only on projects that meet this narrow financial criteria then frankly we would have to drop some of the most needy people and countries in the world. I am sure that is not the message BPR wants to send. And while I accept that BPR is saying "use your other finances to cover these more expensive projects" I think this is not wise. You are promoting a message that is good PR but bad development finance, and WaterAid, Water For People, Care and others should not have to fight this battle over finance in the public arena when this model proposed by BPR is not correct. To be absolutely clear, at US$25/beneficiary WaterAid would only be able to support work in India and Bangladesh, while Water For People would have to only focus on India (West Bengal) as our work in Malawi and Bolivia is over US$25/beneficiary due to distances, costs of materials, low population densities, etc. I sent some data to Rajesh on my experience at WaterAid in Mozambique - in the 7 years I was there we only hit the US$25/person target of BPR on only one occassion - when we got lucky and had a big urban hit that was cheap, levered and had lots of people. That will never be replicated there again. If BPR wants to really learn in 2 years then they should set the learning uyp right now - not enforce an arbitrary cost per beneficiary but spend the time learning what it really costs to help people in various environments and various parts of the world, and build an advocacy campaign from field experience. Last thing Pat - I still would love some monitoring data from Ghana on previous work, as the proposal states you have this system in place. The important observation that Ned makes that i agree with is that BPR does not want to force other orgs to swim against perceptions that we might create if we are successful. For 2 years, BPR talked to many implementers and most of them (including WaterAid) said $25/person was reasonable. So, this was not a number we created, we got it from the field. We created a marketing strategy around it and also convinced ourselves that we could raise money from individuals around the world with that message, at this point i don't think we can ask for $50; nor change our plan; and not use the next 2 years as learning. Also if we go back to learn - we won't raise any money that way - 99% of our funding right now is from a few major donors who have given me some leeway, but that is ending now with the first run. We have funded some projects with higher expenses in the past and i am trying to figure out how to report those, trying to separate the drinking water component from the sanitation. But they were $35, not a $100. Also, i realize that as we move away into more remote regions, costs go up. Most of the 'good' areas have been picked up already (sometimes we get to redo projects that sit over earlier failed one) and so costs will continue to rise. At this point we have to stay with our current plan. If we are successful, i don't see a problem in 2009 to go to $40/person if that is where end up. We look for larger institutions to seed all capacity building efforts and hope to follow up with projects. We did this when 2 folks from Sierra Leone spent 6 months at Barefoot College in India. Upon their return we have funded projects with them. This model really works for BPR and i look to WaterAid and WfP to strengthen implementers enough for BPR to fund projects with them with minimal supervision as they move on to work with other implementers. As we have discussed, this is a noble goal and we fully endorse it - getting partners to apply directly as a sign that capacity building is working and institutions like WFP and WaterAid are not needed any longer. I think that is a step to take and perhaps we can all work on how to do this in practice. On getting US$25/beneficiary from WaterAid and others - that still surprises me (not saying it is not what you were told) but I have shown you that this may be a general cost across an organisation but that - in the case of WaterAid and WFP - our global numbers look lower because we work in India. I guess I thought we were on the same page that a global number may be useful, but that it would have to be based on an understanding that this number is an average and not true everywhere. As you say, you do not want to swim against wrong perceptions and I think BPR would do a great service to all by helping educate on this issue - $25 may be your global goal but you have some lower (like Barefoot) and some higher (like WA Ghana). As such, you should not be saying "keep it under $25 and have organisations like WaterAid and WFP fund the more expensive projects" but rather use this time to look for good projects and keep your eye on the GLOBAL figure, not the individual project figures. Thanks Ned for continuing this conversation. On our end, i will work on refining our message so its more "approx $25 will ..." and not create perceptions that its across the board. We have funded projects in the past that cost more than $25 and i will be working with all of you early next year on the results of these projects to get final data (not application projections). Thanks to projects in India and Vietnam we have latitude to fund more expensive projects but i don't think we can handle that cost well over $50. I have asked for breakdown into sanitation and water components so that we can examine the water side of the costs and while we plan to fund projects in their entirety we can account for the sanitation separately to see how close we can get to $25 per person for drinking water. Our rating does not reflect the quality of the project, but rather its fit with PWX. Blue Planet Run tries to address projects that come close to $25/person and work with organizations where direct contact with implementaters on the ground provides experience and helps reduced some of the bureaucratic layers. Its an expensive project to be sure, and I think highlights the struggles of taking programme approaches and try to find project funding. Maybe could be financed with a plan on how to get the NGO as a future member of PWX (same at WFP, if we can solve the language issue in Bolivia). The project description says all the right things. If you have the goal of hygiene behavior change of 40% in the target communities by the end of the five-year period, how do you intend to measure its achievement? And why only try for 40% coverage in behavior change? Why not 60 or 80%? Improved water supply (using handpumps has a goal of 100% coverage. I would suggest that Peer Water establish a standard budget reporting format so that apples can be compared with apples and oranges with oranges. Some of the projects seem to present their cost estimates in somewhat different formats, making in difficult to assess how, for example, the cost of piped water in Project A in Country A compares with the cost of piped water in Project B in Country B. This would help reviewers to more easily assess whether cost estimates appear realistic. For example, in this budget it is not clear how much budget is allocated for improving water supply, and how much is focused on hygiene and sanitation behavioral change promotion. Typically, of the overall rural water and supply and sanitation project cost, the cost of water supply design and construction is about 75% of the total budget, the cost of improved latrines is about 15%, and improving hygiene and sanitation behavioral change is about 10%. Of course, this differs a bit from site to site and project to project, but it serves as a reasonable Rule of Thumb for comparative purposes. I note that the community contributions are all in-kind, no cash. What do they do when the time comes to replace parts? Are parts locally available? There appears to be no mention of O&M costs and who would pay them.